I can’t believe it is already Week Two for the One Room Challenge!! 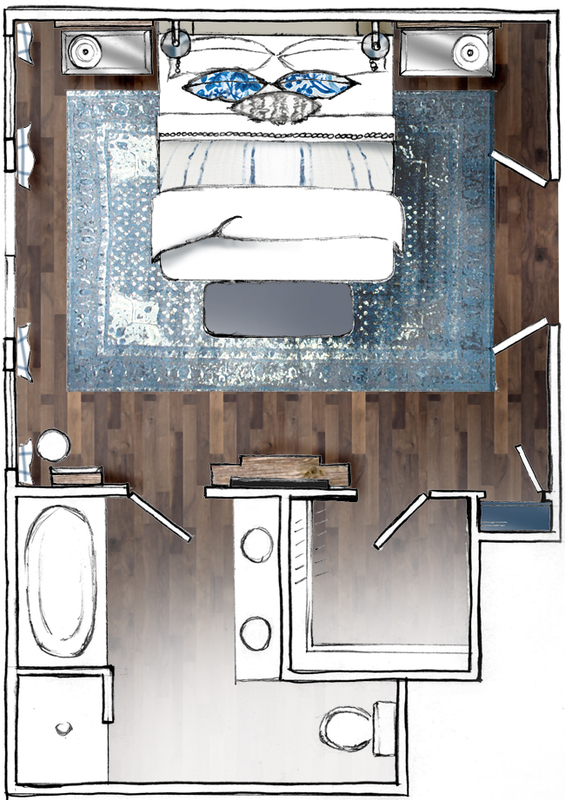 Time to share what the actual design plan is for this bedroom! When discussing the vibe my clients were looking for, they requested a bright & relaxing space for their bedroom. And as I mentioned last week, the rest of their home will be undergoing a pretty significant renovation over the next few months, so having this one finished space be relaxing is key! Having the benefit of being close friends, I am well aware of my clients’ style. They are a bit more traditional than I typically sway, but as my designs always have a strong traditional background I knew we would be able to make this space perfect for them. That is not to say I am not going to push the boundaries a little bit. After all, my favorite design elements often include mixing and matching patterns, textures and colors. Each space I design starts off with an inspiration piece. Last Fall, Cassie’s Living Room was inspired by that amazing Purple Rug. This go around, it is all about a fabric. I fell in love with the Shibori Fabric (the Indigo Dyed beauty pictured above!!) from Tonic Living a few months back. I immediately ordered a sample and as soon as it was in my hand there was no looking back. We were going with a study in blues this time. 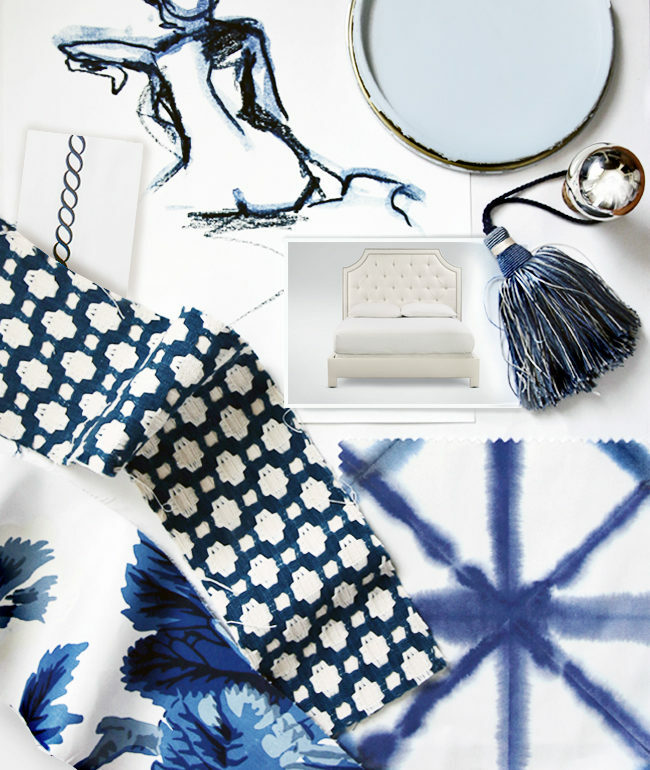 And virtually every shade of blue… Why not?! With all of my inspiration fabrics pulled, I decided to move onto the floor plan. The layout is what it is. With all of the windows and doors, there is only one place for the bed. Exactly where they had it. But we definitely tweaked a few other areas to ensure the room will be executed to their needs. A larger rug, window treatments, a thinner tv console & a bed bench have all been selected & layout wonderfully in the space… at least on the floor plan. So obviously the Shibori was a done deal, now it was time to determine where it would be used. I have only one place in mind. The drapery!! It will be the stand out of the room. Now I am not going to lie… I thought it might be too much for my clients. So when I presented it to them I literally had every finger and every toe crossed. Luckily they loved it too!! The other fabrics are going to be dressing the bed, the most important area of the room. 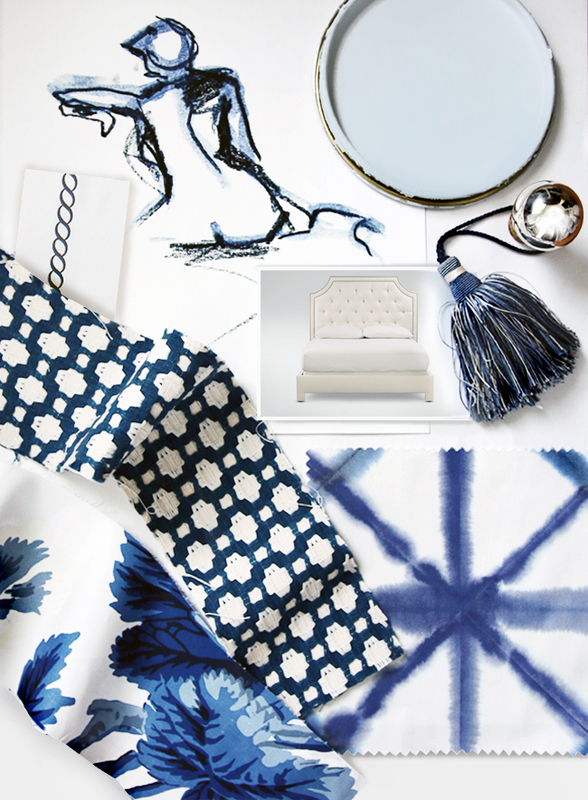 Bed Pillows will be made out of the Pyne Hollyhock Floral & the Indigo Betwixt Fabric. I will also be taking the white bed to a new level by adding in lots of textures & details… One of my tricks from being a Hotel Designer in my previous life. Every hotel wants a White Bed! You have to switch them up somehow. I also knew I wanted to ground the space with a large rug, without covering up all of their beautiful hardwood floors. I have chosen a gorgeous rug in deep blues & grays that might scare someone looking for a light & bright room! But by pairing the darker rug with the lighter drapery, the white bed & a beautiful wall color, I am pretty sure the space will still feel light. Now onto that wall color… we are sampling a few blues this week from Farrow & Ball, but I think Borrowed Light will be our winner. Again, fingers & toes crossed!! It seems to be the perfect shade of light blue without going too “nursery”. Definitely not the look we are trying to achieve. Hopefully next week I will be sharing a fully painted blue room! !